Justice for School Workers Collective Action, Collective Prayer. On Tuesday we had an action at the Department of Labor (DoL) on Martin Luther King Jr. Drive. We wanted to collectively demand the unemployment benefits owed to workers and send a clear message to Georgia Labor Commissioner Mark Butler that we are building across work places and we are not going away. Workers from multiple work places were represented including food service workers from Georgia Tech Sodexo, Emory Sodexo, Clark Sodexo, Spelman Aramark, bus drivers from GSU 1st Transit, Ft. Benning Taylor Motors and "Smart Kids" Pre-K education. Students from Emory Students and Workers in Solidarity (SWS), as well as students from Morehouse and Clark participated as part of the UAW Global Organizing Institute. We collectively entered the DoL and asked to speak with the manager. While we were waiting for the manager some of the drivers from Ft. Benning and others engaged with the unemployed Georgians that were already waiting at the DoL office, passing out fliers and letting folks know why we were there. We waited for the manager to come and address us, but the manager never appeared so we started doing chants in the lobby to be sure we got our message across "No ifs, no buts, no unemployment cuts!" Inside the office on the wall there is a picture of Mark Butler beaming. Many of the workers wanted him to understand what they were going through... One bus driver asked how he would feel if 3 months of income was suddenly denied without warning. With a salary of $120,000 Mark Butler wouldn't feel it like every single one of the school workers does, but perhaps it would help him to empathize on some level. We brought out the bull horn and various workers gave testimony to the office about what they were going through and also what they wanted from Mark Butler: reinstatement of unemployment benefits and the moneys owed to them that they have already been denied. Channel 11 filmed the testimony from workers. Eventually the police showed up. At this point we all circled up and kneeled down together to pray in the lobby. We then left the lobby and heard testimony from school workers outside of the office and de-briefed the action. The compelling stories from the school workers demand a deeper understanding. The work that they do, the lives that they touch and the people that rely on weave the fabric of our community. 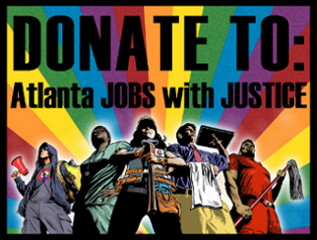 The Atlanta Jobs with Justice Workers' Rights Board will be hosting a "People's Court" so that our community can hear these stories. Mark Butler will be invited to the event to share his side of the situation as well. There will be "judges" at the event (community leaders, faith leaders, professors and local celebrities) that will hear both sides of the situation. And the community in attendance will have the opportunity to vote on whether or not Mark Butler has trespassed on the well being of our community by denying unemployment benefits to 64,000 Georgians. This event will be taking place on August 18th, 11:00 am to 1:30 pm. Location to be announced. About 65,000 School Workers across the State of Georgia have lost access to unemployment benefits ever since GA Labor Commissioner, Mark Butler, unilaterally decided to cut these workers off from the unemployment insurance they have been paying into and receiving for over 16 years. Georgia's schools workers across the state have begun to stand up against this arbitrary change in the unemployment benefits policy. It is important to continue this fight and to stand up for restored benefits and stable jobs for theses workers. School workers,their friends and family members, concerned citizens, and community groups, can take several simple actions to stand up to Mark Butler and make him reverse his unemployment benefits decision.